The resurrection of Jesus is not a happy ending. We think that the story is neatly wrapped up in a bow. and they first tremble with fear and then rejoice in wonder. if only because nothing is ended. This is the part of the story that is still going on today. It is why we are here today. who died for us and was raised again. And now we are the ones who tell the story. says Jesus to those gathered in the Upper Room. and if it is to be passed on, it must continue through us. is not yet the happy ending. but it is not yet fully come. of forgiveness of sins and salvation through Christ. has been a witness for many years in this community. or if they have all passed into the Church triumphant. in the growing suburbs south of Pittsburgh. they are the ones called to bear witness to the resurrection. and administer the Sacraments among them. And so the people of St Stephen were here. realized they wanted that child to be formed in the faith. whether here or in another place where God led them. in the Sacraments to those who come to receive them. The Risen Christ is indeed in our midst. who were called to bear witness to the Gospel of Jesus Christ. you too are called to be a witness to the Gospel. I think that the word ‘witness’ is a little confusing. or trying to engage people in conversation about faith. Remember what I’ve been talking about. how our faith community, our congregation, is a witness. and a call to others to celebrate it. which proclaims repentance and forgiveness of sins to all nations. if we hear God’s call to be a witnessing people in new ways. and to lead his people in witness. the rest of it would take care of itself. and to connect us with the witness of the Church in other places. So I ask for your prayers in doing that. 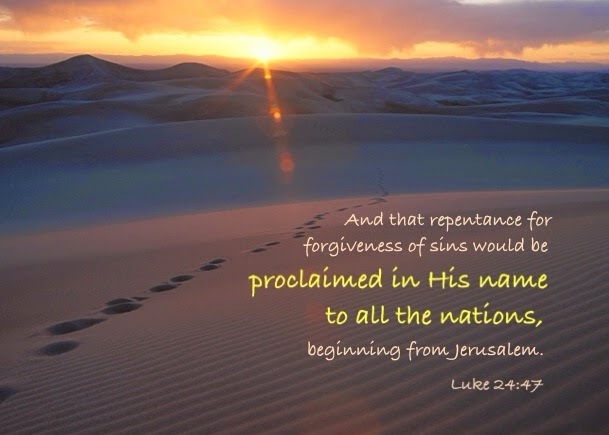 and hear the call to repentance and the assurance of forgiveness. so that others may be caught up in this story. for our witness does not end after a set number of years. we can bear witness to the resurrection. And so we should not think that our witness must grow fainter. how many mercies he has shown. that his resurrection is not the end of the story. drawing other people into the story. and to pass it to others.